The OLD Big Dead Sidebar: Are You Afraid Of The Brewers? Mr. Hartwig provided a great piece that made me fear the BrewCrew for just a moment. However, after sleeping on it, that moment has passed. "I am not afraid of the Milwaukee Brewers." Despite the fact that they just brought in the reigning AL Cy Young award winner, I am not afraid of the Milwaukee Brewers. Because this team has holes. And it's not like the Northside Nine doesn't have holes, the Brewers have holes like the cheese that the Swiss produce. Don't believe me? Follow my lead. At 49-39, the Beermakers are 10 games over .500 and in second place in the NL Central. However, their much ballyhooed offense has just produced a +11 run differential. The Cubs are not only sitting pretty atop the division at 53-36, they own the best run differential at +102. Prince Fielder isn't living up to either part of his name. He's hitting .268 with 16 homers and 45 ribbies. Fantasy darling Rickie Weeks has been anything but that. He's hitting .208 with 8 bombs and 23 ribs and 11 swipes. Bill Hall made a deal to hit 30 homers a few years ago, but in 2008 is only hitting .227 and wants out if he's not playing third. 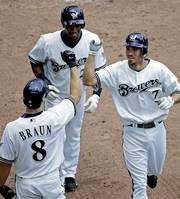 Ryan Braun (.288/21/59) and Corey Hart (.296/14/55) are carrying this team. And it might last the rest of the year, but it won't mean squat if Fielder or Weeks or even Hall aren't hitting worth a lick. There's no doubt the front-line pitching is there with Ben Sheets (10-2, 3.77 ERA) and Sabathia but after that...eh. And while the naysayers are waiting for Kerry Wood or Carlos Zambrano to fall apart, you never know when Sheets is gonna pull a Mark Prior and end up on the DL. As for the rest of the rotation: Dave Bush (4-8, 4.74 ERA) and Jeff Suppan (5-6, 4.71 ERA) don't scare me. In fact they make me want to grab a bat and take some hacks. And while Manny Parra has potential, at this point all he has is potential. Salomon Torres (15 saves in 18 opportunities) is filling in as the closer quite well in the abscense of Eric Gagne who seems to be struggling since his appearance in the Mitchell Report. However, I'm sure that his ERA at the end of the season will be closer to 3.89 than the 2.89 it is now. Look, Kudos! goes out to the Brewers who are looking to escape the laughingstock shadow as given to them by one Allan H. "Bud" Selig, but after they lose Sheets and Sabathia, it's going to be a long haul back to the (almost) top of the NL Central.